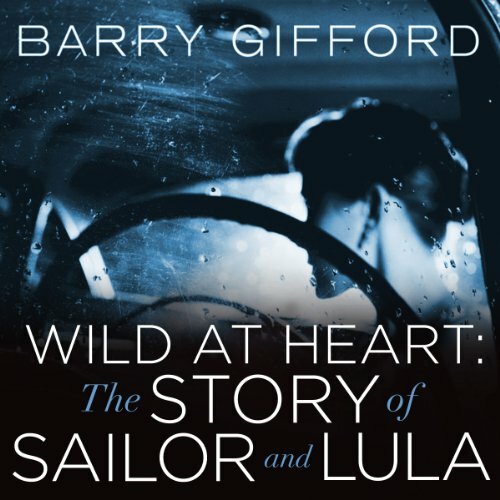 Wild at Heart is a novel from Barry Gifford's Sailor & Lula: The Complete Novels. On the 20th anniversary of the publication of Barry Gifford's international best seller, Wild at Heart, as well as the anniversary of the Palme d'Or-winning film adaptation by director David Lynch, Sailor & Lula: The Complete Novels presents all of the novels and novellas that comprise the saga of Sailor Ripley and Lula Pace Fortune, "the Romeo and Juliet of the South": Wild at Heart, Perdita Durango (also made into a feature film), Sailor’s Holiday, Sultans of Africa, Consuelo’s Kiss, Bad Day for the Leopard Man, and The Imagination of the Heart. ©1990 Barry Gifford (P)2013 Audible Inc.
"Wild at Heart" is a crazy novel. It is almost plotless and most of it consists of characters recounting bizarre anecdotes in cartoonish Southern dialect. But it's enjoyable for the irrepressibly charming relationship of Sailor and Lula whose indestructible love for each other is very moving despite the absurdity and craziness of the world they travel through. Reading Barry Gifford out loud is incredibly difficult, thanks to his use of extreme Southern dialect? And his densely-packed pop culture ref'rences? You know? Eva Kaminsky does a pretty good job. It's not a bravura performance, as the drawl gets a little monotonous at times, but on the whole she captures the lazy, spaced out style and the accent really well, and succeeds in ensuring that the protagonists are loveable. She made we want to listen to the rest of the series. I absolutely love the movie and could watch it a thousand times over. However after listening to the story, I have to say that I am grateful that they didn't follow the book exactly. The narration is perfect but the story is disappointing in comparison to the movie. I would still recommend this audible book to anyone who likes a good love story.